Each of the first three books of Ilona Andrews’ Kate Daniels series was better than the last, but once they passed that trilogy mark, each subsequent book got a little more joyless and plodding. 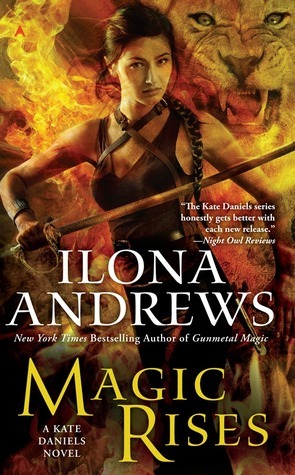 Magic Breaks is the seventh book (of what was initially planned to be a seven-book run, but has now been extended to ten planned books) and the first to be released in hard cover,* so it was the first that I decided not to buy and instead checked out from the library. By halfway through the book, I was starting to think this might be the last book of the series I read at all. I had initially been attracted to the series because it has such an unusual approach to the vampire/werewolf genre and it was laugh-out-loud funny. The last several books have lost pretty much all humor, just sort of slogging through long gory descriptions of violence. The first half of this book felt like a bit of a chore. However, much like Patricia Brigg’s vampire/werewolf series, this one ends with such a game-changer that I am once again hopeful for the series. The violence continues to escalate, until things (temporarily) resolve in a very interesting way that should clear out some of the distracting clutter of previous story lines in a very interesting and potentially very funny way. *Unfortunately, as much as the authors and publisher try to market this hard cover edition as a possible introduction for new readers, it really isn’t a stand-alone book, and has to be read in the order of the series. For those of you crazy people out there who don’t obsessively check in on their favorite author’s websites, we at Bibliotherapy here for you! 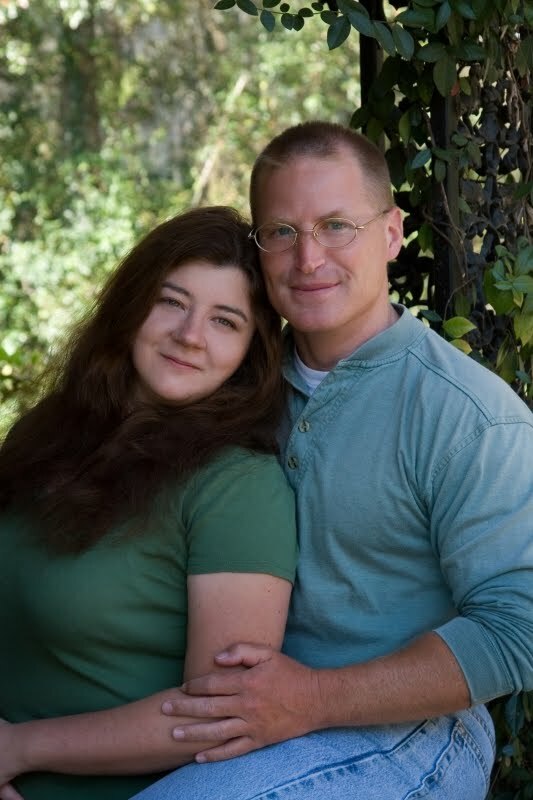 Ilona Andrews is one of my favorite authors currently writing and she has quite an active website, in which she posts regular snippets of stories, and, more to the point, posts Christmas presents to her fans. Her Kate Daniels series is all told from the point of view of Kate Daniels, but has Curran, the Lord of the Beasts and Kate’s love interest, as another main character. The Christmas present is a collection of short snippets retelling pivotal moments in the Kate Daniels books from Curran’s point of view. It’s quite fun and while I recognize several of the snippets from having been posted individually on prior occasions, other snippets I don’t recognize at all. So, if you enjoy the Kate Daniels’ series: here’s a “Merry Christmas!” from Ilona Andrews. As an aside on first impressions, when I first got the book, I was somewhat taken aback by the cover. The featured woman looks somewhat different than previous illustrations of Kate Daniels, which is fine, artists change visions, etc., etc. But, doesn’t she look strikingly similar to someone else instead? I feel like, as an artist, you should take your inspiration from wherever you like, but maybe don’t make it so blatant. A very mild spoiler for the series: book 3 settled a romantic tension that had run through all three initial books, and all the subsequent books have had relationship drama that I don’t care for, and increased violence, possibly to counter-balance the relationship drama, now that I think about it. A lot of the violence, too, was starting to be directed toward various magical (and deadly) creatures that populate the world, and I have a big problem with violence against animals, even fictional ones. A true hypocrite, I don’t have nearly the same problem with violence against people, which is why I was fine with the earlier books. I was still committed to the series, but was not anticipating this book with the eagerness I had earlier in the series. In fact, this book way exceeded my expectations, and I believe rejuvenated the series a bit in a very clever way. Andrews changes the setting from Atlanta, Georgia, where all previous books are set, all the way to Europe, so there is a freshness just in the change of scene. With the new setting, she also constrains the number of characters, which had been expanding exponentially with each book, until the action started to get muddled with so many players. Magic Rises is pared down to just a cleanly written and plotted, extraordinarily fun supernatural adventure, and I am just so, so happy to have my favorite fluff series back. One caveat to all of my praises: I went back to the earlier books to double-check a minor character’s name, and it reminded me of the casual humor and one-liners that made the early books such a pleasure. As the books have ratcheted up the drama and tension, that humor has mostly disappeared and I miss it. I almost feel like that as the authors have become more accomplished, they perhaps have edited out those parts as being less polished, and that makes me sad. * There has been some update in information from this original review. The series has been expanded to ten books instead of the previously planned seven, when the authors realized that they would not be able to wrap it up conclusively in just two more books. So, Rebecca has previously reviewed the third book in Ilona Andrew’s Edge Series, and in her review she wrote that she thought each book in the series was better than the preceding one, which I disagreed with. The third book was actually my least favorite and had pretty much convinced me to bow out of this series. Then, I was bored one day and noticed that Andrews had posted a lengthy excerpt from the brand new fourth book, Steel’s Edge, on her website; I figured it couldn’t hurt to read it, just to congratulate myself on my decision not to read any more of them. However, as you have probably noticed from this lead-in, it is really good! Each books features a male protagonist introduced in a previous book and a new female protagonist, and I was almost immediately interested in the new female character. Both characters are also in their early- to mid-30s, which is both refreshing and increasingly more relatable to me. I’m now very much looking forward to reading this one, though I’m at least sticking to my guns on not buying it, so I’ll await the library. This is a pretty mixed review given that it’s for a book that I enjoyed in a series that I loved. I enjoyed this book a lot. There was fun banter and exciting action and all sorts of fun. On the other hand, it wasn’t exactly the best work of literature I’ve run across, not even the best by this author. The plot depends more on shiny-magic-handwaving than it does on logic and the characterizations are pretty dependent on introductions from previous books. There are also a few scenes that seem to have been included for no particular reason at all. I assume those scenes are part of the set up for the next book, actually. That actually brings me to skirting around a spoiler that I wrote about in one of my spoiler posts, regarding how this book was written primarily in order to set up some circumstances in preparation for the events in the next book. This book is well-worth reading as the next building block in a really awesome series, but I don’t think it can or should stand alone. I definitely recommend the series, though, but start at the beginning and read them in chronological order. While the main series is planned to have seven books, I would say that this counts as book 5.5. While focusing on a side character, the events of this book are necessary to the development of the series in general. The suggestion to read the books in chronological order includes, incidentally, the suggestion to read the novella, Magic Gifts, which is included at the back of this book, before reading Gunmetal Magic. Which means, that when you get the 448-page book, the first thing to do is to flip to approximately page 330 and start reading. 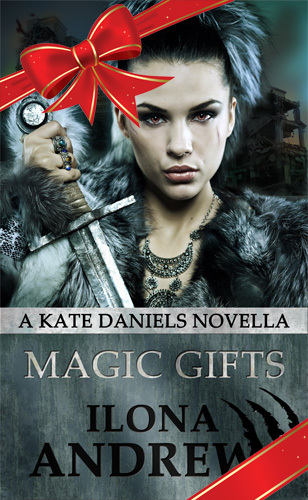 Magic Gifts is the story of what Kate Daniels, the main character of the series, is doing in the background during Gunmetal Magic, which focuses on the adventures of Kate’s best friend Andrea. On the plus side: One thing that I really appreciated about Gunmetal Magic is how deftly it managed to flirt with but then avoid the classic romance-novel cliché of the love triangle in which one girl must choose between two guys. While the structure is still there, Andrea deals with the situation in a realistic fashion without all the angst and general waffling that I had feared. I was impressed. The characters were fun, the banter was fun, and I was pleased at the romantic resolution. On the minus side: This could be a plus or a minus, depending on your perspective, I suppose, but the book covers some heavy ground regarding extreme childhood abuse very lightly. Maybe a bit too lightly. It’s not that I want to read a realistic depiction of how extreme childhood abuse affects adult relations (which I assume would be horribly depressing,) but I kind of think that introducing the issue and then not dealing with it might be worse. On the other (third?) hand, I’m willing to handwave away some of that with a vague explanation of magic and societal changes, etc. As I mentioned in the previous post, I attended a book signing by Ilona and Gordon Andrews yesterday evening. In the first part, I described what they said regarding some of their books and stories that were published prior to a week ago. 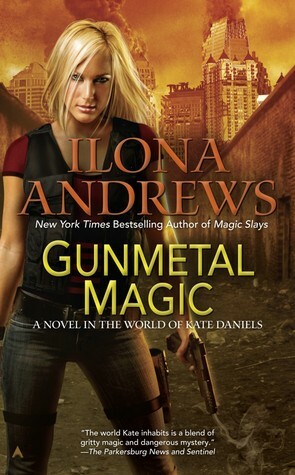 This post describes Gunmetal Magic and future Ilona Andrews publications. First, there are a few general things about upcoming books, and then more specific spoilers under the cut. 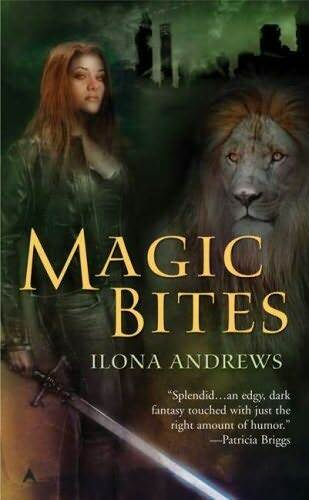 The Kinsman series (currently consists of Silent Blade and Silver Shark) seems to have been primarily written by Ilona (the woman) with less input from Gordon than the other Ilona Andrews (the author) stories. Thus, it was a bit disappointing when she said she didn’t really have any ideas regarding what to write for any future stories set in this universe. Too bad. But she did say that they had plans to write something to post for free on Christmas as a present to their readers, and that story could potentially be set in that universe. I’ll live in hope. The next book set in the Edge series is planned to be the last of the books. They sold the rights to a TV series, which would be awesome, and is yet still extremely unlikely to actually come to fruition. Depending on reader and publisher interest, Gordon seemed to think there might be another book following a slightly more grown up Jack and George, but there are no real plans for it at the moment. However, there are solid plans for a Jim and Dali book which should come out after the Kate Book 6 book but before Kate Book 7. And now, for the real spoilers. If you don’t like spoilers, don’t click the link below.